During restoration 2007, discovery of former entrance door in center of west facade. 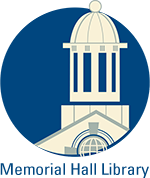 Themes: Agricultural, architectural, community development. 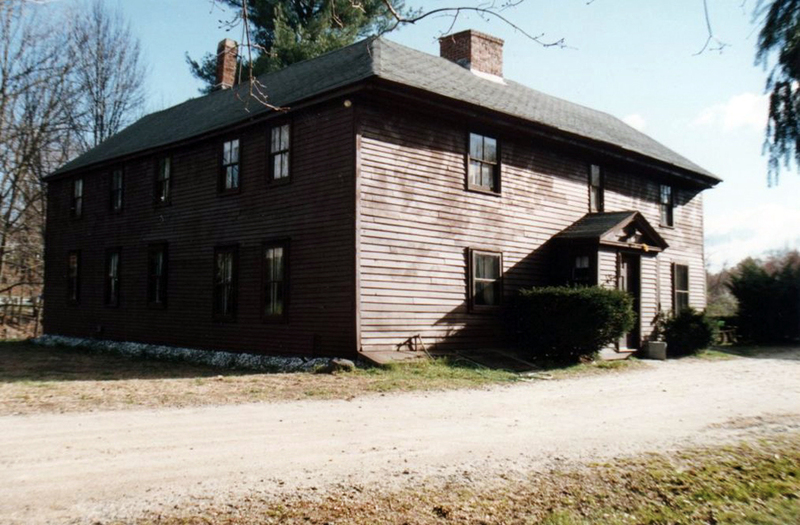 One of the ancient homesteads of the Chandlers is located at 88 Lowell Street in the West Parish. The house was built before 1673 by Captain Thomas Chandler. His daughter Hannah and her husband Captain Daniel Bigsby continued to occupy the house after the death of Hannah's parents. 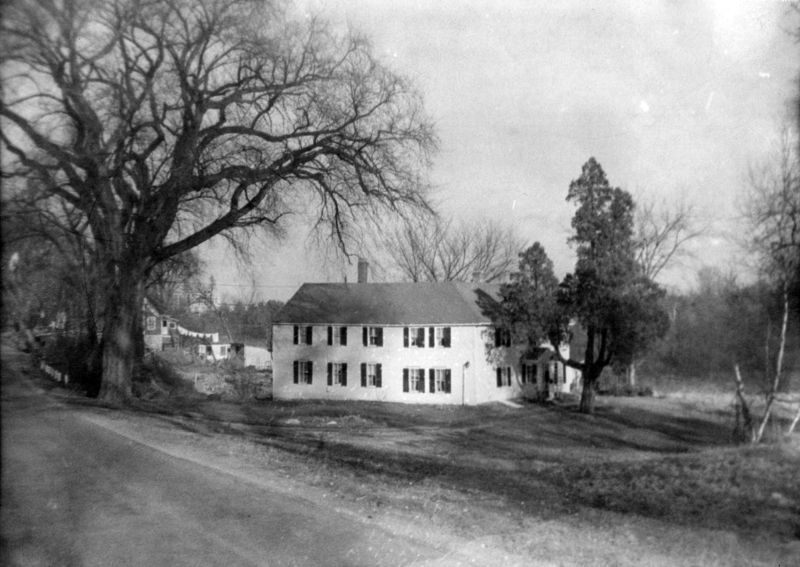 The farm consisted of over sixty acres on the south side of Lowell St. and extended east to the Shawsheen River. Several additions have been added to the original structure including a lean-to addition to the northeast rear and an ell on the northwest side. 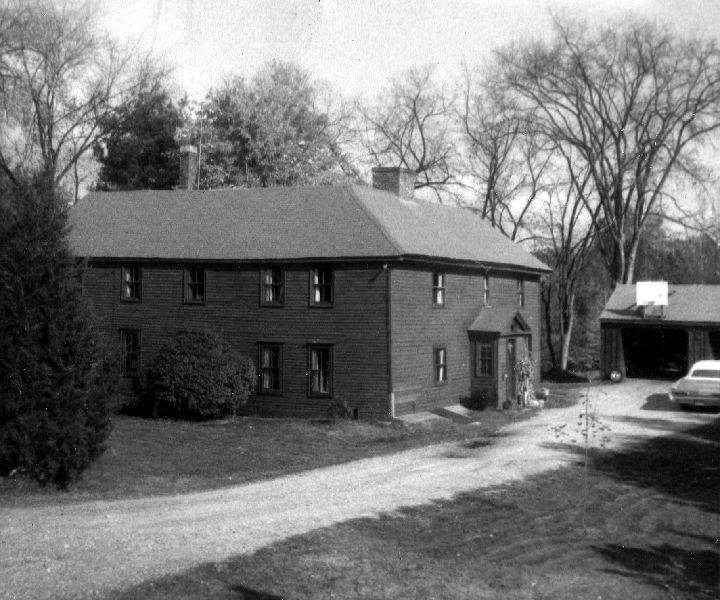 It is believed to be the oldest First Period home still standing in Andover today. The interior rooms on the south facing side on both levels contain huge hand hewn summer beams with chamfered edges and gun-stock post corner beams. Many of the interior wall sheathing are covered with horizontal tongue and grooved or ship-lap wide pine board paneling. The kitchen fireplace is nearly 7' wide x 5' high and 42" deep. The original chimney was removed at some point in the early twentieth century and rebuilt in the early 1960s. The floors are all wide pine boards measuring 12" to 22" in width throughout the house. There are two separate cellars, one below the kitchen on the east end of the building and accessible only by a south bulkhead door. The second cellar runs under the west end of the house and continues northward under the ell addition. This foundation however takes an unusual turn, leaving a small portion of the northwest corner not excavated. Three stairways once descended into this basement. One next to the kitchen fireplace, one by bulk head on the south front west side and the third under the back NE stairs. There is no basement under the center portion of the main house where the center chimney was built nor under the lean-to addition. Six rooms are on the first floor and two entry porches and five rooms on the second floor. The main staircase is enclosed in vertical paneling. A second stair way built on the northeast corner of the ell is also enclosed, but in plaster walls. There is evidence of an older staircase in the middle room of the ell on the first floor which may have been removed when the last addition was built. Most floor and roofing timbers in the entire house have been hand hewed. The roof construction is framed with post and beam rafters with horizontal purlins. The wood sheathing runs vertical from eve to ridge pole. Evidence of a small fire on the north wall of the kitchen can be seen on the wall studs. There are a variety of window sizes and styles from different periods but the majority of the window openings measure only 24 inches wide. An 1888 map shows two barns on the property and the site still has the foundation of one on the East end of the house. The existing garage built in 1961 and has a full basement below was razed in 2008 and is now the site of the new home on the divided lot. The following is a chronology of the residents and owners of the property for the last three hundred years. Thomas Chandler was born about 1627, the oldest of five children of William & Annis Chandler of Roxbury, MA. William was a tanner in Roxbury by 1637 and owned an estate of 22 acres. William dies of consumption Feb. 26, 1641 and their mother Annis remarries on July 2, 1643 to John Dane (Dean) of Berkhamstead & Bishop-Startford, England. John had first settled in Ipswich and later to Roxbury. Thomas Chandler's other siblings were, Hannah, William, John and Sarah. Thomas and his brother William were among some of the most influential men of Andover's first settlers after the town incorporated in 1646. Sister Hannah Chandler would marry two other very influential men in Andover; George Abbot Sr. and after his death, she became the 3rd wife of the Rev. Francis Dane, Andover's 2nd minister in 1647 and son of John Dane. Thomas Chandler was one of the first Proprietors and Freeholders of the town, a blacksmith by trade, he served as a Representative to the General Court of Massachusetts Bay Colony in 1678. It is thought that his iron works was located on the Shawsheen River near Marland Village at Stevens Street. 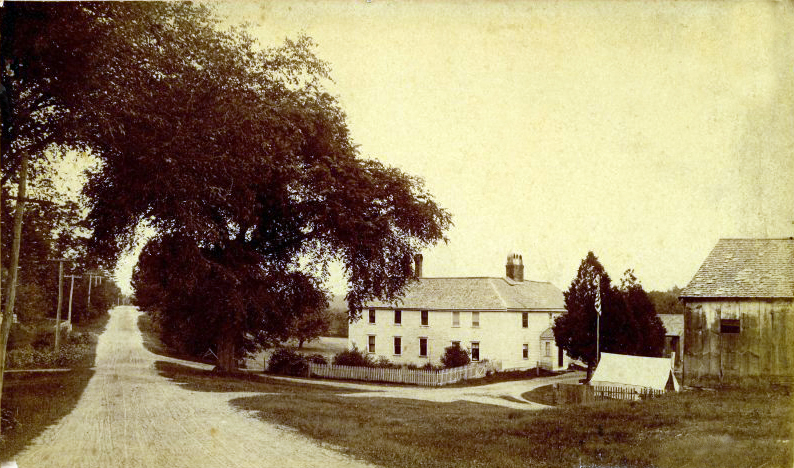 Brother William ran an Inn on the road from Ipswich to Billerica. William Chandler & Annis (Weld or Alcock?) of Roxbury, Mass. 2-I. Capt. Thomas, b. about 1627 (according to deposition, 1692 Witchcraft Delusion) m. Hannah Brewer about 1651, daughter of Daniel & Ann Brewer of Roxbury. Hannah dies Oct. 25, 1717 in Andover age 88. Thomas dies Jan. 15, 1703, age about 76. 3-II. Hannah, b. about 1629, m. Dec. 12, 1646 George Abbot in Roxbury. Move to Andover. George dies Dec. 24, 1681 age. 66. Hannah m. 2nd Rev. Francis Dane Andoverâs first minister. He dies Feb. 17, 1697 age. 81 after 48 years of service to the church. Hannah d. June 2, 1711 at about age 82. 4-III. William, b. 1633 m. 1st Aug. 24, 1658 to Mary Dane, daughter of John Dane and Elinor Clark of Ipswich. Mary was b. 1638 and d. May 10, 1679 Andover. William marries 2nd Bridget (Henchman) Richardson, widow of James Richardson of Chelmsford Oct. 8, 1679. William dies 1698. 5-IV. John, b. about 1635; m. Feb. 16, 1658 to Elizabeth Douglas, daughter of William Douglas and Ann Mattle. John was a Deacon and Selectman, settled in Woodstock, Conn. He dies April 15, 1703 at Woodstock, Ann died two years later on September 23, 1705. 6-V. Sarah, b. Roxbury; m. Nov. 4, 1659 to William Cleaver. He was killed by Indians at Sudbury, MA April 29, 1676 while serving under Capt. Wadsworth. Sarah m. 2nd Mr. Wilson, 3rd Ephraim Stevens and a 4th to Mr. Allen. 2-I. Capt. Thomas Chandler, (William) b. about 1627 m. Hannah Brewer about 1651, daughter of Daniel & Ann Brewer of Roxbury. A Captain in the Militia, Representative to the General Court of Mass. 1678-9, and a blacksmith by trade. Ultimately a rich man, carrying on a considerable ironworks, of which he makes mention in his will, giving each of his sons a fourth part of his share in the works. Thomas dies Jan. 15, 1703. Hannah dies Oct. 25, 1717 in Andover at age 88. 7-I. Thomas, b. Oct. 2, 1652 d. June 6, 1659 age 7y 7m. Hannah Chandler. She dies March 2, 1741. John was a Captain and Selectman in Andover. Nov. 20, 1730. Daniel died May 7, 1717 age 66. Foster of Boxford on Sept. 3, 1697. 11-V Sarah, b. Dec. 20, 1661 d. April 5, 1757 age 96; m. May 29,1682, Samuel Phelps. He dies Jan. 26, 1745-6 age 95. Wars. He did service as a scout and was a Representative in 1690 & 1694 to the General Court. 13.-VII Henry, b. May 28, 1667, d. Aug. 27, 1737 in Enfield, Conn. M. Lydia Abbot of Andover, daughter of George Abbot & Sara Farnum of Rowley. B.
Andover and had of his father Thomas' s homestead. He moved to Enfield, CN in 1723. John Brown of Amesbury Iron works on Powwow River. 12-VI Captain Thomas Chandler (Thomas, William.) married May 22, 1686 to Mary Peters. 15-I Mary, b. Feb. 18, 1686-7 m. Kendall Goodwin and moves down east. (Maine)? 16-II Annis, b. March 24, 1689 m. June 19, 1711 Josiah Johnson, m. 2nd Benjamin Robbins. 19-V Timothy, b. Mar. 29, 1694-5 d. 1771 m. Nov. 2, 1724to Hephziba Harnden, widow of Abiel Chandler; She dies March 17, 1783 age 94. Abigail Blood of Groton. He was a tanner, purchased 40 acres in Chelmsford and moved in 1720 to what later became Westford. 22-VIII Hannah, b. Aug. 23, 1700 m. Aug. 21, 1723 to Andrew Johnson. He was in the Expedition to Crown Point in 1756. 1780. David died in Pembroke, MA. Before 1774. 28-IX Jonathan, b. Oct. 20, 1712, bapt. Nov. 16, 1712 d. March 23, 1725. The name of Bixby is variously spelled in the old records, Bigsby, Bixbe, Byxbee, etc. The ancestor of the American family is Sergeant Joseph Bixby. He first appears in Ipswich in December, 1647 when he married Sarah (Wyatt) widow of Luke Heard of Ipswich. She probably came from Assington, England, as she then had land there. He was a carpenter; and lived in Ipswich until 1660, when he settled in Rowley Village, now the town of Boxford. He belonged to the military company in Topsfield, and was chosen sergeant of the company in 1666. He was a soldier in King Phillip's War in 1676; was made a freeman March 22, 1689-90; and died April 19, 1700. The inventory of his estate amounted to 167 pounds, 16s 10d. His wife Sarah survived him and died, his widow, June 3, 1704, aged eighty-four years. 5.-IV Mary, b. Feb. 18, 1659, in Ipswich m. __________ Stone. 6.- V George, b. Rowley Village now Boxford, a merchant, m. Rebecca ___________ before 1693. Admitted to the First Church in Boxford in 1704. 7-VI Jonathan, b. Rowley Village, now Boxford, a husbandman, m. Sarah Smith of Topsfield Feb. 2, 1692-3. He died in 1717. 8-VII Daniel, b. abt.1651 in Rowley Village, (now Boxford). He was a carpenter and husbandman. 8-VII Daniel Bigsby, a carpenter and husbandman. married Hannah Chandler Dec. 2, 1674 in Andover by William French. She was the daughter of Capt. Thomas Chandler and Hannah Brewer of Andover. Thomas Chandler conveyed to his so-in-law, Daniel Bixby sixty acres of land near the Shawsheen River, April 12, 1688 for 40 pounds. Chandler dies in 1703 and mentions his daughter Bixby in his will. In 1697 Daniel conveys to John Abbot for five pounds, thirteen shillings and eight pence in current money; a parcel of swamp land lying ;within ye Township of Andover; and formerly in the possession of Capt. Thomas Chandler on ye East Side of ye Ridge near Little Hope, containing about five acres and one half & twenty nine rods.This land today is near the high school playing fields, east of Indian Ridge. Baker's Meadow on Reservation Rd. was Little Hope Meadow. Daniel died May 7. 1717 age about 66 years old, his will dated April 12, 1715, being proved July 1, 1717. Mother-in-law Hannah Chandler dies in October 24, 1717. Daniel's widow Hannah died Nov. 20, 1730. The will of Daniel Bixbey names all his children except Daniel and Jonathan. If his daughter in law Rachael should have a living child by his son, the child is given 20 shillings. All his lands and buildings were enjoyed jointly by his wife and son Joseph, who were made executors. The daughter Hannah had had her portion. Rachael was the widow of Jonathan. 12-II Hannah, b. Dec. 13, 1679, m. Nov. 4, 1714 to Stephen Barnard Jr.
13-III Thomas, b. Dec. 18, 1681, m. Dec. 8, 1703 to Deborah Elkins lived in Chelmsford, husbandman. 15-V Jonathan, b 1685? m. Rachel Hol____? 16-VI David, b. Feb.15, 1687-8; m. Abigail Butterfield, lived in Chelmsford, husbandman in 1717. 9-VIII Benjamin b. Rowley Village now Boxford, was a yeoman, m. Mary _________, before 1690. They lived in Topsfield. Benjamin died about 1730. They had seven children. 10-IX Abigail, was living in 1699. 1. William Abbot, son of Nehemiah, (Nehemiah, George, George) & Sara Foster, b. 1724 d. Jan. 2, 1798 of Consumption age 73 y, married June 4, 1747 to (20-I) Experience Bigsby, daughter Daniel Bigsby & Hannah Chandler. b. 1723? d. Sept. 4, 1815 at age 92 years. Sarah Poor. Hannah d. Sept. 3, 1823. age.70 y. 3-II Bigsby, (Bixby) b. Nov. 24, 1750; d. 1813; lived both in Andover and Greenfield, NH; m. 1772 Hephzibah Ames; Jan. 9,1772, d. May 20, 1796 age. 40y 7m. 2nd m. Mary Johnson, Jan. 1, 1801. 4-III Hanna, b. July 15, 1753; d. June 1792. 5-IV Lucy, b. Sept. 23, 1758; d. 1798; m. April 11, 1776 to John Brown of Hopkinton, NH. 7-I Hannah, b. July 10, 1773. 8-II Lucy, b. Oct. 9, 1775; d. Aug. 16, 1798 of nervous fever. age 22 y 10m. 9-III Jeduthun Jr. b. June 18, 1777; lived with father; m. January 17, 1805 to Betsy Bridges. 10-IV Fanny, b. March 30, 1779; d. July 19, 1829 ae. 50y. ; m. Nov. 25, 1802 to Osgood Johnson; d. Dec. 23, 1808 of Consumption ae. 31y 6m. Rebecca A., b. March 11, 1806 d Feb. 2, 1821. ae. 15 y. 11-V - Lydia, b. Mar. 24, 1781; d. Feb. 1843; m. Feb. 12, 1801, John Lacer Richardson of Corinth, VT; 2nd m, Deacon Folsom of Corinth, VT.
14-VIII - Abigail, b. May 23, 1790 d. Oct. 24, l844; m. Sept. 26, 1813 to Capt. Thomas Chandler Foster. Children; Caroline A., Sara Jane, Hanna Abbott, Abigail and V. Caroline who m. Joseph Abbott, son of Herman Abbott. 15-IX Pamelia, b. Oct. 11, 1792; d. Aug. 31, 1798, cholera morbus, age 5y 10m. 16-X Rebecca, b. Mar. 10, 1795; d. Sept. 8, 1798, fever 3y 5m. 9-III Jeduthun Abbot Jr. (Jeduthun, William, Nehemiah, Nehemiah, George, George) b. June 18, 1777; son of Capt. Jeduthun & Hannah Abbot lived with father; m. January 17, 1805 to Mary (Betsy) Bridges. Caroline Mackey b. Feb. 23, 1823, Esther Ann b. Feb. 6, 1826, Jane Green b. July 23, 1828, William A. b. Aug. 9, 1831, Amy F. b. Dec. 11, 1832 and Sally Barnard b. July 10, 1838. 1888-Map of Andover - Anthony Ward b. Sept. 26, 1826 d. Aug. 29, 1901 age 75 m. Sarah Dodson b. March 16, 1833 Yorkshire, England, she came to America in 1847 at age fourteen, in the company of her parents, and eleven brothers and sisters. d. April 22, 1919. Sara joined the West Parish Church on March 5, 1876 and at the time of her death was its oldest member. Anthony was a farmer, and was associated with the Lawrence lodge, I.O.O.F. He taught his sons Richard and George farming at 88 Lowell Street. Richard later becomes a milkman and operated a dairy in Lawrence until 1905. He and his family lived at 63 Lowell St. George and his family lived next to the homestead at #78 Lowell Street. After Anthony and Sarah died Margaret continued to reside in the homestead until her death in 1939. All the Ward family seems to have been active members of West Parish Church and the Andover Grange. All are interred at West Parish Cemetery. Children; Emma Maria b. 1878 and Fred b.
relief. He was highly esteemed resident, well read and took a keen interest in world affairs. then goes to teach at Harvard, MA. 6-V Margaret Julia b. Oct. 6, 1860 d. Dec. 28, 1939 dressmaker in Lawrence, graduate of Punchard High School Class of 1880. 1956 - 2006 James D. & Ethel M. Wilson- purchase the house in 1956. James D. Wilson b. 1921 was a Sales Engineer and town Selectman from 1959-1964. Ethel, his wife, was a housewife. The Wilson's built the garage in 1961. The chimney and fireplaces were also rebuilt about this time. Contractor to restore and rehabilitate the property via Special Dimensional Permit - Massachusetts Historical Commission approval 2006 - 2007, Preservation Restriction recorded in the Registry of Deeds. Andover Historical Society Vertical Files, Abbot, Chandler, Ward, & Bixby families.